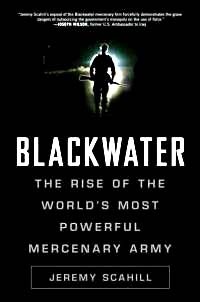 Blackwater: The Rise of the World's Most Powerful Mercenary Army is a book published in 2007 by Jeremy Scahill, a producer and correspondent for "Democracy Now!," a daily radio and TV news program, and a regular contributor to The Nation magazine. Alice Cherbonnier, "Blackwater Reveals Underpinnings of 'Private Security' Industry", Baltimore Chronicle, March 26, 2007. Jeremy Scahill, "Bush's Shadow Army", The Nation, April 2, 2007. Media Mouse, "Book Review: Blackwater: The Rise of the World's Most Powerful Mercenary Army", Mediamouse.org, April 13, 2007. This page was last edited on 5 February 2015, at 14:16.